Be cool and brush up or learn how to write with cursive. Once taught everywhere in schools, cursive is becoming a dying writing art. 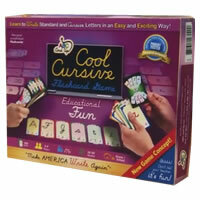 Teach or remember cursive with this fun educational matching card game. Kids or adults won't even realize they are learning with this great card game. Cool Cursive makes your brain think as it needs to recognize four cards that represent the same letter but are all written differently. To those even well versed in cursive, at times this can be a brain teaser and will keep you on your toes. Give Cool Cursive a try and let it help you with your cursive. Review Completed (2017-09-23) Cool Cursive is an interesting and basic spin of a classic collect four card game. 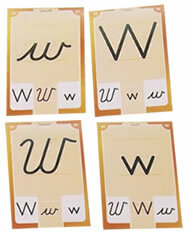 Players are challenged to make a match of four of the same letters (other possibilities are allowed) all while making sure they are written in four different ways: both uppercase and lowercase block and cursive writing. Fairly easy to do for those that are comfortable in writing both ways but can be a bit of a brain teaser at times since your brain has to switch gears between the two different writing styles. We found this game to be entertaining and educational which was clearly the intent of the game makers. There are secret cards in your hand, community cards in front of you, a draw pile and even wilds that allow you to force someone’s hand to become part of their community pile. More special moves are listed in the game rules. We found these minor twists add a great deal of strategy and fun to the game. We loved the school theme of the cards which took us back to our elementary school days with lined paper, practice letters and cute borders around the cards. Most of us playing admitted that we haven’t written a full sentence in cursive in a long time but it was fun brushing up on all the letters that aren’t part of our name’s signature. We received some fairly good quality cards although we’re not sure if these were the final quality the game will be printed in. The detail and graphic design of the cards and rules indicate this will be a well put together game when it's professionally published. The rules were well written, short and to the point with some useful examples. Overall, as an educational game geared more for kids, Cool Cursive is a good family game that engages and entertains kids and adults alike. It plays quick and is a welcome change to so many of the other card games out there. Player with the most sets of letters is the winner at the end of the game. 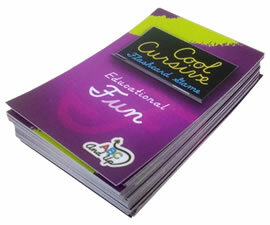 Comes with 108 cards and the official Cool Cursive game rules and instructions. Please keep in mind that the official Cool Cursive dice-card rules and instructions could be different depending on the game version you have. The rules below are some of the exact directions on how to play Cool Cursive. Share with us your comments, funny stories, tips, advice, strategies, creative ways to play, questions about how to play, problems with the rules or anything you want about Cool Cursive. All submissions will be reviewed within 24 hours. Click here to add your Cool Cursive comments.